The defending world champion Golden State Warriors have the best straight up record in the NBA. The problem is that they are in the red with the NBA betting online record this season. The Warriors and their superstar leader Stephen Curry are simply too popular with the general betting public. Much like a high quality but overvalued stock the Warriors have too many buyers. The San Antonio Spurs have struggled to maintain good betting value on the road. The big problem for the Spurs is a serious lack of offense that can keep pace with the better teams in the Association. Golden State hosts San Antonio on Saturday night. As great as the Golden State Warriors undeniably are they are in a bad NBA betting online stretch lately. The NBA champs have an overall record of 41-23 straight up but just 23-30-1 against the spread. At the ORACLE Arena the Warriors have come away with the cash in just 10 out of 26 games. In their last ten games the Warriors have delivered the goods just three times. Incredibly enough the Warriors have lost three out of their last four games straight up. In their last game Golden State lost in bad fashion 125-105 to Oklahoma City. Under the total has hit in four out of the last five games for the Warriors. Curry is averaging 27.3 points per game. He was held to just 21 points in the loss to Oklahoma City. Head coach Steve Kerr has orchestrated the top ranked offensive team in the NBA. Of concern is a defense that ranks 23rd in the Association. The San Antonio Spurs have a record of 35-21 straight up and 29-25-2 against the spread. On the road the Spurs have covered the spread in just 12 out of 28 games. In their last six games the Spurs have paid out just twice. Over the total has hit in four of the last six San Antonio games. Few teams could be more opposite of the Warriors than the Spurs. Head coach Gregg Popovich’s team ranks 27th in the Association for offense but number one for defense. Golden State has had the sportsbook wagering edge in this head to head series. 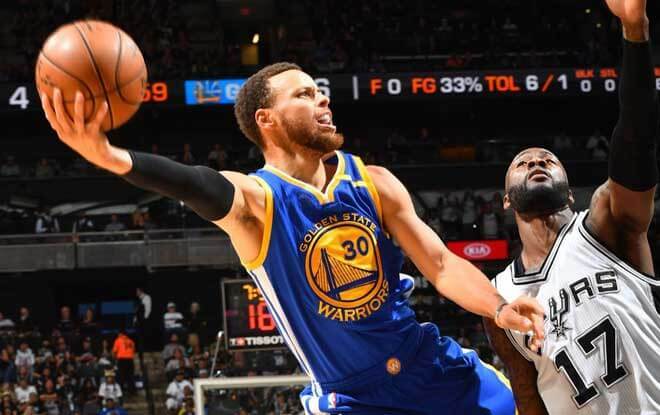 The Warriors have come away with the cash in five out of their last six games with the Spurs. The over has paid out in five out of the last six meetings in this head to head series. At the ORACLE Arena the Warriors have covered the number in four out of their last six home games with San Antonio. The last four meetings at Golden State in this Western Conference rivalry have gone over the total. The Warriors have the NBA betting online advantage with the best player on the court in Curry. San Antonio’s lack of offense does not travel well. Golden State has the head to head numbers over San Antonio. We’ll ride the Warriors in this one.